The Gerber 45905 Camp Axe is a good size for canoeists and hunters able to carry larger gear on their backwoods journeys. Although it's nearly indestructible, the wrap-around handle style does limit the cut compared to traditional builds. That's really the only drawback to this axe's nearly one-piece construction. Owners shouldn't have problems with broken handles or loose axe heads if the tool is used properly. 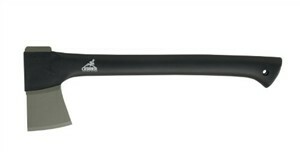 The glass-filled nylon handle completely surrounds the tool steel axe head and is molded seamlessly to it. Lightweight and only 1-1/2 feet long, the axe still delivers plenty of chopping power with most of the two pounds focused in the axe head itself. That puts the force of the swing where the axe cuts. When the axe strikes, very little of that force comes back to your hand. For either chopping or splitting, you'll find that wrapped handle a bother if you tackle anything big. In a deep notch, the handle catches the wood and deflects the blow, and the axe could stop short if you're splitting tough hardwood. No tool is unbreakable, and twisting the axe to break it loose could cause structural problems. The axe is still tough enough that careful users with some skill and common sense should experience no trouble. Gerber includes a belt sheath of ballistic nylon fabric, a sensible and safe way to carry this useful woodsman's tool. For a larger version of this durable modern axe design, see the Fiskars Pro Chopping Axe. I ordered this camp axe from bass pro and was very dissapointed to find out that it doesn’t conme with a sheath as state in the add. Is there one? Or anyway to get one?